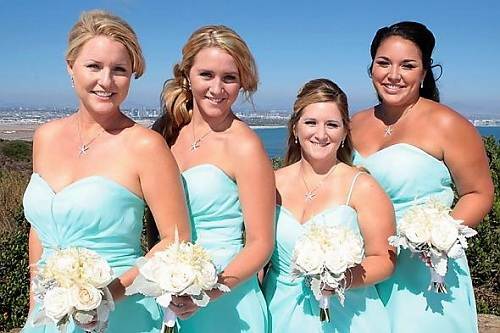 Tiffany blue is such a lovely color, and Tiffany blue bridesmaid dresses will make your bridal party look amazing. Blue is often believed to be a color of peace for the heart and mind. Seems like a good wedding theme, right? Blue is also considered energizing. So it can give your wedding some excitement! It also is a great color for outdoor or beach weddings. 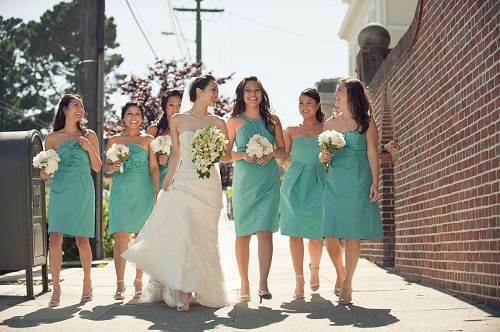 Tiffany blue bridesmaid dresses are available in all lengths and look good in short, mid and long lengths with the dresses cut according to your desire. A Mid or tea-length dress in Tiffany blue gives off a retro vibe. I love the look for a spring or summer wedding. 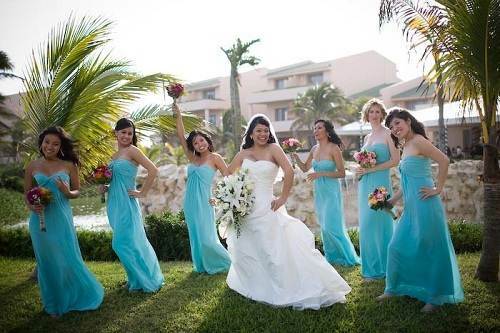 Long Tiffany blue bridesmaid dresses such as those above have a nice beach style to them. These would be the perfect beach bridesmaid dress for a destination wedding.